In preparation for an upcoming trip to India with the girls (and a looong flight ahead), it’s only fitting to switch things up and talk about some of our in-flight essentials while traveling. The list can go on and on, and vary depending on the length of your flight and travel plans, but there are a few things I would absolutely not leave home without. I tried to be pragmatic and concise keeping a long flight abroad (with subsequent flights and possibility of road travel) in mind. This list may particularly come in handy if you are used to shorter flights and have a long trip coming up. Clothing- Pack one or two outfits for a change of clothes in your carry-on. It seems like common sense but I have heard many stories where a diaper leaked or something spilled, and accidently all clothes had been packed in the check-in baggage. Be sure to also pack a hoodie or cardigan since it often gets chilly on an airplane! Blankets/plush toys - anything your child needs for comfort/sleep. My girls definitely need their favorite blankets before bedtime! Sanitation/hygiene - Hand and face wipes, disinfectant wipes, hand sanitizer, flushable wipes, to-go toilet seat covers, a small paper towel roll, and a tooth brush (flushable wipes and toilet seat covers are mostly for our trips at our destination). We take a lot of things for granted in the western world so I always like to be over-prepared when traveling abroad and ready for the unexpected. You can get most of these items in travel sizes to make them easier to carry! Snacks - I typically pack a bag full of dried fruit and nuts (thankfully no nut allergies here), cheerios, chips, veggie sticks, goldfish, animal cookies, and sandwiches for at least one leg of the flight (in case one of them is being picky about flight food). These also come in handy during a very short layover when we don’t have enough time to buy food. Medicine - Ibuprofen, Acetaminophen, nasal spray, band-aids, Neosporin or any antibiotic ointment to go. My fellow mom friends whose kids have allergies don’t leave home without an epipen. Vaseline/Aquaphor (travel sizes) - Both of my girls have very sensitive skin and skin gets particularly dry during flight travel. Bring chapstick if that’s more convenient. Entertainment - Books, tablets with favorite apps, some form of Etch A Sketch or doodle & erase toy, coloring books with limited crayons, stickers, a pair of headphones each. We also pack a couple of new 'surprise' toys so those toys can amuse them for a little bit longer than the other usual ones. Water Bottle - An empty bottle that you can fill on the plane and keep handy so your kids have easy access. Not having to depend on the flight attendant or the next inflight service is helpful. A lot of patience and a full belly - Being well prepared helps A LOT, however, a 24-36 hour journey, with multiple flight changes and time zone differences with kids in tow isn’t easy. When the girls are asleep, it is very tempting to order another glass of wine and catch a movie (my husband likes to do that), but I chicken out and try to get some rest while I can. We take turns napping and hope for the best! Baby carrier - When our oldest was a baby, and we traveled with just her, I tried to avoid carrying a stroller when I could. For the first couple flights with the baby, carrier worked like a charm. It didn’t slow us down, and I could still roll my carry-on. Feeding - Inflatable nursing pillow and nursing cover for breastfeeding and/or plenty of bottles and formula supply. While it’s cute and all, I am not a huge fan of kids carry-on luggage especially for long flights. 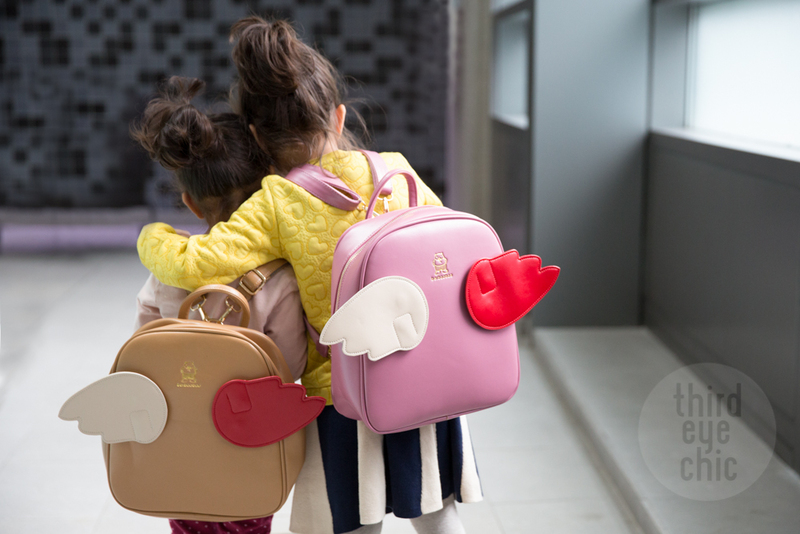 I am all for a small backpack with their essentials, now that they are old enough to choose their favorite toys. I like to be as ‘free’ and mobile as possible in case we are rushing to make a connecting flight or one of the kids is too exhausted to pull their bag, etc. I avoid toys with small parts that keep falling or any foods/coloring supplies that can potentially get messy. The less of a hassle, the better. I steer clear of shoes with laces/buckles. Definitely choose easy to wear slip-ons or velcro sneakers while traveling. The more you travel, the more you’ll learn what your family needs! It can be stressful at times but just remember to laugh at the unexpected and enjoy the journey. Hopefully with these helpful tips and list you’ll be more prepared and ready to tackle any challenges that may arrive. Safe travels! Very informative blog.It helped me a lot.Sharing your experience and thoughts with other's is often very helpful.Well,Keep it up.Good blog.